The updated S100 shade from Aladdin Lamps no longer features a built-in shade support, and does require a 12" tripod or shade support. Simple and economical, the 12" white parchment shade diffuses the bright light produced by the Aladdin burner, and provides a soft warm glow. For use with all Aladdin lamps. 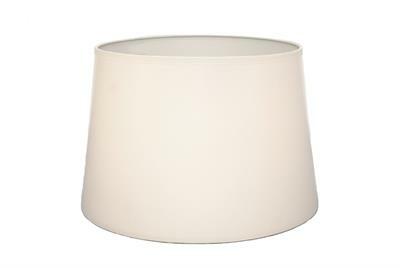 Ideal for shelf lamp models (Genie II, Genie III, and Aluminum Watchman style) 12" base diameter. This shade style is very similar to the Caboose style shades sold on the Model B lamps in the 1930s-1950s. Previous Aladdin stock number was S100 (with built in tripod.) The built in tripod style has been discontinued and is no longer available, sorry! Features a flock of ducks, flying over marsh, in green and tans. Aladdin Lamps Coach and Four Parchment Shade in Autumn features rich yellows, oranges, and browns. Styled after the Aladdin shades of the 1930's and 1940's. Tone on Tone Blue Parchment Shade with White and Black Accents. The 14" White Parchment Lamp Shade from Aladdin is simple and economical.